QUICKEST AND EASIEST WAY TO CLEAN CARTRIDGE FILTER. INSTANT RESULTS NO SOAKING NEEDED. o OILS, MINERALS and DEBRIS. 1. 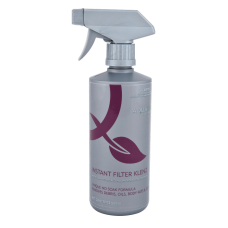 KEEP YOUR FILTER AS CLEAN AS POSSIBLE BY CLEANING IT REGULARLY. 2. MAKE FILTER CLEANING PART OF YOUR REGULAR WINTER MAINTENANCE PROGRAM. YOU'LL BE AMAZED HOW CLEAN YOUR FILTER LOOKS AFTER EACH TREATMENT.